Sanctions freeze Venezuelan president’s assets under US jurisdiction and prevent US citizens from doing business with him. Maduro hailed Sunday’s election as a popular mandate to dramatically recast the troubled state, but his political opponents have warned this could lead to the dissolution of existing powers and turn the country into a fully fledged dictatorship. On Monday, he was added to the growing list of high-ranking Venezuelan officials target for sanctions which freeze any of Maduro’s assets under US jurisdiction, and prohibit US citizens from doing business with him. Acording to Reuters, the US is still considering broader sanctions against Venezuela’s oil industry, which could prove devastating for a country which is already in a state of economic free fall. 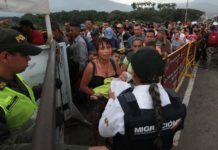 The targeted sanctions against Maduro “send a loud message that the US is prepared to get tough,” said Michael Shifter, president of the Inter-American Dialogue, a Washington-based think tank. But the specific targeting of Maduro signals that for the moment “the US is not comfortable with broader sanctions,” he said. Last week, the US Treasury department imposed sanctions on 13 high-ranking officials including the head of the Electorate Council and the former treasurer of the state-run oil company PDVSA. Because Venezuela relies on oil exports for 95% of its revenue, opposition figures have warned that broader sanction targeting the oil industry could further exacerbate the social and economic crisis facing the country. At least 10 people died in clashes around Sunday’s vote, during one of the deadliest days in nearly four months of political unrest. Maduro had insisted that a new constituent assembly would help restore peace in the oil-rich nation. But analysts warned that the vote was likely to further heighten tensions within the country – and further isolate it on the diplomatic stage. At his first public appearance after the vote, Maduro struck a belligerent tone, threatening to jail opposition legislators and promising to restructure the office of attorney general Luisa Ortega, who has become a prominent and vocal critic of his government. “Some of them will end up in cells facing justice, while others will end up in a psychiatric ward because they have shown clear signs of insanity,” Maduro said on Sunday night. “We must impose order,” he said. Ortega – who was appointed by Maduro’s predecessor and political patron Hugo Chávez – said that Venezuela’s government had “dictatorial ambitions,” and warned that the new assembly will put “absolute power” in the hands of a minority. 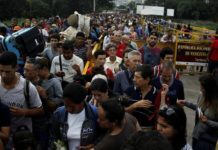 The country’s National Electoral Council said that over eight million votes had been cast but the figure was immediately disputed by the opposition, which accused the electoral body – which is allied with Maduro’s government – of inflating turnout figures. Opposition estimates put the actual turnout at close to 2.5m. Photos and videos of virtually empty polling centres circulated widely on social media throughout Sunday. Independent analysts put the figure closer to 3m. Nikki Haley, the US ambassador to the United Nations, dismissed the election as a sham. Further diplomatic isolation seems inevitable, however: countries across the region – including Argentina, Canada, Colombia, Mexico, Panama and Paraguay – said they would not recognize the result on Sunday’s vote. Maduro said he had received congratulations from the governments including Cuba, Bolivia and Nicaragua. Russia also expressed support for Maduro and in a thinly-veiled warning to the US said it hoped that countries which “apparently want to increase economic pressure on Caracas will display restraint and abandon their destructive plans”. The British foreign minister, Boris Johnson, warned that Venezuela “stands on the brink of disaster” and urged Maduro to stop the escalation of tensions. “It is time for the government to see sense and start working with the opposition on a way forward that brings the people of Venezuela back together,” Johson said in a statement. The new 545-member constituent assembly is scheduled to be sworn in on Thursday, although Maduro hinted in his speech that it could be sooner. It is unclear how the assembly will function – or even where the members will meet. Opposition leaders said that the new body will not help restore the rule of law in a country which has been rocked by almost daily street protests and violent repression. “This is a process that died at birth. It has no legitimacy. Venezuelans don’t recognize it, nor does the international community. The message is clear: the government was defeated. They got, at best 3 million votes – that is more than 3 million less than when Maduro was elected four years ago,” said Julio Borges, head of the opposition-led National Assembly. The assembly has made clear that it will not cooperate with the new body. “We will continue with our duty and our commitment to the people,” said the assembly’s president, Julio Borges, who added that deputes they will continue to hold sessions in the public building “where the people placed them” – despite government threats that the newly elected constituent assembly could replace them. The opposition is calling for more street protests, and on Monday a vigil was held for those who died during Sunday’s poll. According to the interior ministry, ten people died, and seven police suffered serious burns when an explosive device targeted a motorcycle convoy in the capital, Caracas. Yet, the general mood among people in Caracas was one of defiance. “We succeeded in showing the world how rogue this government is,” said María Blanco, a 39-year-old economist who has been unemployed for the past two years.